The capital is the city of Kofu　甲府. Kooshuu 甲州 Koshu is the old name of the domain.
. Inden 印伝革 deerskin goods . a government-designated "Traditional Craft of Japan"
. Tanabata ningyoo 七夕人形 star festival dolls . O kabuto san オカブトサン "Honorable Helmets"
They are made from papermachee and show warriours, sometimes mounted on horses. They were a favorite in the samurai families of the Edo period. Some even say this is the figure of Lord Takeda Shingen.
. hatobue 鳩笛 pidgeon whistle . It was used by hunters in autumn to lure pheasants. During the Festival on the 15th of April men dress as ladies and put on make-up, then carry mikoshi to fight against each other.
. Shingen Daruma 信玄だるま　.
. fukuryuu 福龍 lucky dragon . They are made from strong washi paper, just a head on a bamboo stick and a string to perform the tricks. The eyes can roll and change color from white to black to read. The tongue comes to stick out. Main figures are Sanbaso, Fukusuke or a cat. 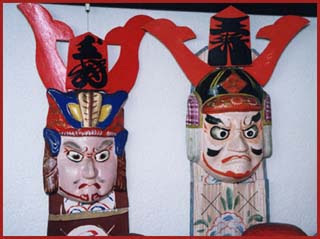 Craftsmen in the Taisho period, who made papermachee Daruma dolls, became interested in the karakuri mechanical dolls. They begun to sell these simple dolls with moving parts at the Daruma markets in Yamanashi. They are not made any more nowadays. 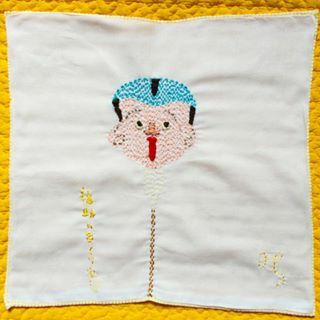 This is a version stitched by Michiko san.
. obake no Kinta お化けの金太 Kinta the Ghost . The shrine is in a far corner of a valley, but this clay bell is one of the three most famous ones in Japan. The golden bell is held by a white-red auspicious cord. This thin cord was used to bind the bell to the belt of a nervous child. When the cord broke and the bell was lost, the child was healed. The first bell of this kind was made by the the goddess Kushinadahime, wife of Susanoo no Mikoto, to appease her own child. Kanazakura Shrine is located in Mitake-cho, Kofu City, Yamanashi Prefecture. Enshrined are five deities including Susanoo-no Mikoto, Yamato Takeru no Mikoto and Sukunahikona no Mikoto. Known as the birthplace of crystal in Japan, it enshrines crystal balls as the sacred treasure. It is said that the original shrine was founded during the reign of Emperor Sujin (97-30 B.C. 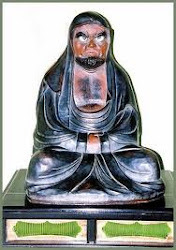 ), when Sukunahikona No Mikoto was enshrined at the top of Mt. Kinpu. In the later period, when Yamato Takeru dropped in at this shrine to offer a prayer on his way to the eastern land, he founded a shrine at this place as the satomiya (village shrine). During the Warring States period (1493-1573), the shrine was worshipped by the Takeda clan as their oratory. It was also protected by the Tokugawa clan in the Edo period (1603-1868). The shrine building was destroyed by fire in 1955, and reconstructed into the present vermillion Honden (the main hall) in 1959. This shrine is believed to bring the benefits of recovery of illness, getting rid of bad luck and luck with money. In spring, the shrine is crowded with a lot of cherry blossom viewers to enjoy 600 cherry trees in the precinct including the very rare tree named “Turmeric Cherry,” which produces yellow blossoms. The daughter of Ashinazuchi and Tenazuchi. About to be devoured by the serpent Yamata no orochi, Kushinadahime was saved by Susanoo in exchange for becoming his wife. 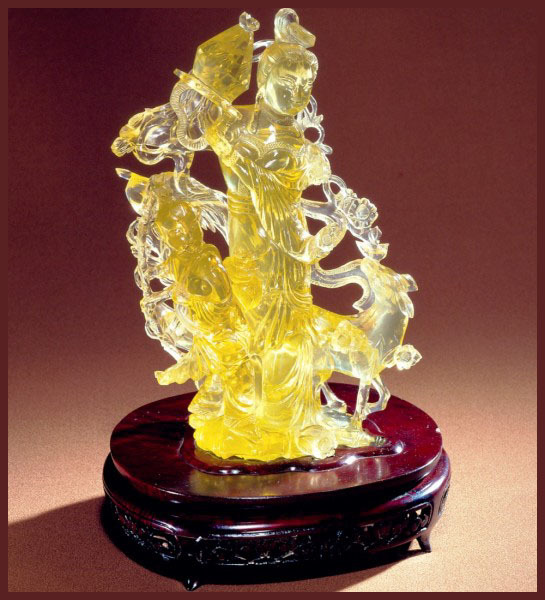 Susanoo transformed the girl into a comb and placed her in his hair, then defeated the serpent. He afterwards built a palace in Izumo where he married her. To enfold the new bride. "On coming to this place my august heart is pure," —and in that place he built a palace to dwell in. So that place is now called Suga. When this Great Deity first built the palace of Suga, clouds rose up thence. Then he made an august song. cloud iridescence, zui-un 瑞雲 or sai-un 彩雲.
. Koizumi Yakumo 小泉八雲 Lafcardio Hearn .
. Kofu Daruma 甲府だるま Yamanashi Daruma from Kofu . Yamanashi has many local industries that are deeply rooted in its history and climate, and are well known nationwide, including the wine, textile, insho seal and washi (traditional Japanese paper) industries. The industry that particularly stands out nationally is jewelry. Yamanashi’s total jewelry production stands as high as 37.8 billion yen per year, or a third of the Japanese market—making Yamanashi the number one producer in Japan. The history of jewelry in Yamanashi can be traced back to the Jomon Period (14,000 B.C.-300 B.C. 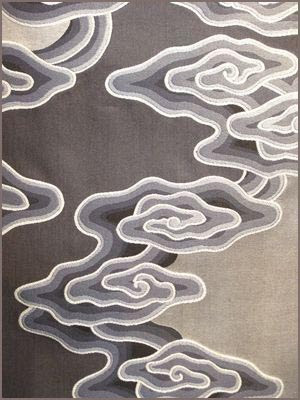 ), but the development of decoration techniques came to the fore during the late Edo Period (1603-1868). 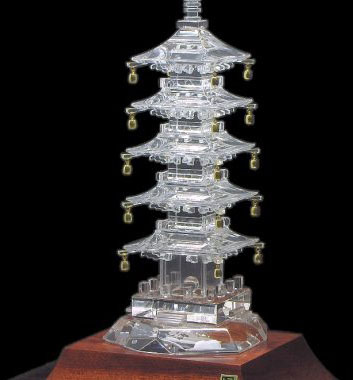 Yet it was the Meiji Period (1868-1912) that ushered in the golden era for crystal jewelry. When the Meiji government promulgated a mining act, intense excavation commenced. Though crystal mining existed throughout Japan at the time, no resource district could be compared to the mines surrounding the foothills of Mount Kongo in Yamanashi, leading the region to become Japan’s chief production center for crystals. Later, due to the exhaustion of local gemstone resources and other factors, some dealers inevitably went out of business. However, a great effort was put into importing gemstones from abroad and shipping both domestically and internationally, enabling the region’s high-quality polishing techniques to be passed on. One characteristic of Yamanashi’s jewelry is its integrated production, a methodology that is uncommon even worldwide. Everything from the cutting of gemstones to the metallurgy and even the finishing touches of the jewelry are all done within the prefecture, and products ranging from metal crafts to jewelry are widely produced in the region. Consistent quality has been cultivated in these various metal works, and a stable production output has been maintained. 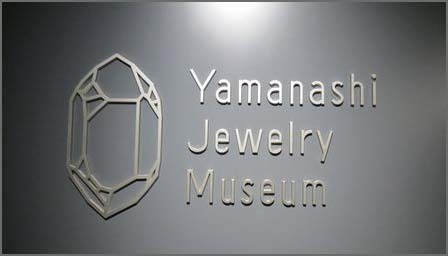 Today there are over 1,000 companies involved in Yamanashi’s jewelry industry. These companies have stoically pursued the peak of quality, with local appraisers of precious metal products ensuring that high-quality jewelry products like no other are constantly being produced. A production center revitalization project has recently been developed, by which the entire industry aims to improve the quality of all aspects of production, including materials, techniques and design. Recognized under the brand Koo-Fu , training programs have also been implemented to cultivate young successors to the industry. With a combination of an established tradition and a welcoming embrace of younger generations’ innovative ideas, Yamanashi jewelry will surely continue to prosper for years to come. This craft started some one thousand years ago, after quartz was found near Mount Kinpu beyond Mitakeshosenkyo, which is famous for its beautiful views. When it was first discovered, it was used as an ornament but by the middle of the Edo period (1600-1868), Shinto priests were taking the raw material to Kyoto to have them made into gems. 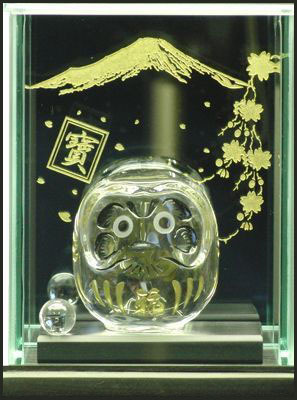 Koshu Suisho Kiseki Zaiku started in the latter days of the Edo period, when master craftsmen were welcomed to the area and began polishing quartz on an iron sheet using a emery powder called kongousha made from a very hard stone, rather in the way that diamonds are polished. Ornaments and items of jewelry are being produced today. Many of these pieces have been created to make the most of the distinctive features of the natural gem stone, meaning that no two items are alike. - and Daruma san !
. 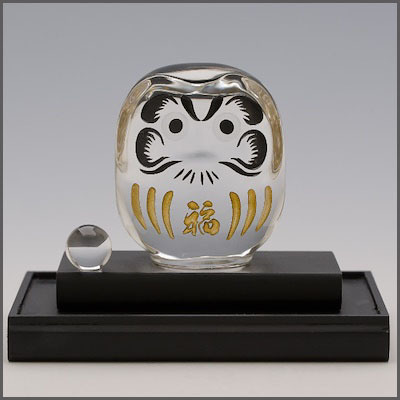 . . CLICK here for more Photos　of crystal Daruma 水晶　だるま　!
. 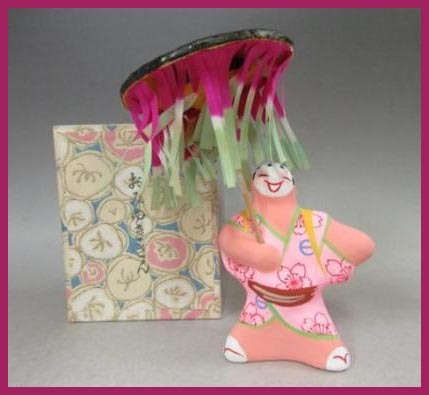 suishoo koogei 水晶細工 Suisho crystal art and craft .
. Yamanashi Folk Toys - this BLOG .